Spring has sprung and we are all feeling it. Some, I am sad to say, have allergies, so they feel it in a different way. The happy blissful way I feel it is in the wakening of the earth. Apparently so do my children. Walking down to the bus stop one morning my daughter of 11 years said, “look, the tree’s are waking up, isn’t it beautiful?” This was of course, music to my ears! She was referring to the bright green new leaves, which at this point are nearly fully flushed out. One of my most favorite colors in the world, which occurs in my yard nearest the wood line during early spring, is the color of newly emerging grass. I would describe this color as emerald green. The blades of grass are so tender and supple. They actually shine they are so radiant with new life. As it should be for new life with vibrant health. No wonder that new life is arriving now. The good Mother does have a plan! Rain showers are still with us. This is good. Nothing like a good long steady soaking rain. We received over 2.5″ (probably more) in about three days.This is not too much for me. I should be able to get back to planting in the next few day. I need to give the rain a few days to soak in fully. Just the perfect amount of rain to pull any lingering weeds. One of my most favorite weeding tools, the stir-up hoe. So very effective when the soil is soft. Thank you rain for that. Easy tool to use, push or pull it just below the soils surface. It cuts the weed off. Most of the time I can simply leave the weed laying there to decompose in that spot. Perfect! A word of advice, make sure the blade stays sharp so you will not have to work extra hard. If you have not worked with a dull tool before give it a go, just to see the difference, or take my advice and keep it sharp. A word of caution about this tool, it works! Be mindful of the plants that may be emerging around where you are working. It is so very easy to get overly zealous and cut down plants you were not intending to cut down. I would recommend looking a little ahead of where you are getting ready to use the hoe, just like when driving. The stir-up hoe was one of the gifts my dear father seemed to really appreciate that I gave him. It’s difficult to give a gadget guy something they haven’t already purchased for himself. I truly felt a feeling of accomplishment when my dad, a retired (only by means of people not paying him) landscaper, found my gift of a weeding tool was a new treasure. I can not say what exactly happen this winter with the honey bee’s. It seemed that one colony lived and the other, well, perhaps died and was taken over by a swarm. I have lost a fair share of colonies over the past eight years. Not sure why they have all died, but it looked to me that these girls may have starved to death. 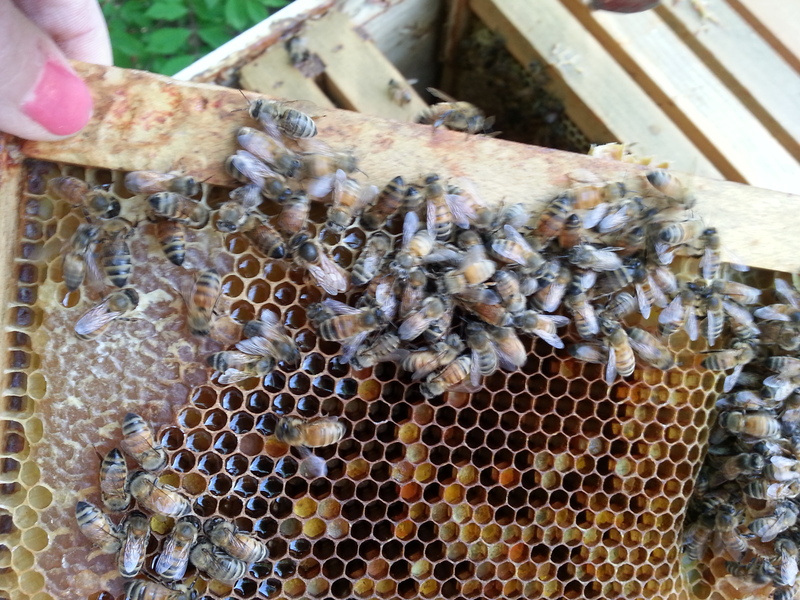 Many of them had their faces and part of their bodies “stuck” in the comb. Poor dears, what a way to go! My friend, Veronica, husband Tim, and I harvested about ten pounds of honey from just four frames. The next day we placed the harvested frames back into the honey super. Hope we will have more to harvest in July! The bee’s seem to be doing well. Fingers crossed we will have gentle showers, as not to wash all the pollen and nectar out of the flowers so that the bee’s can do what they do now for their winter life. Too much good must be balanced? We have all heard the expression, “You have to take the good with the bad”. But can there be too much good? Must we have bad to balance out the good. Or is it that we have to have the bad to appreciate the good? Either way I don’t like, nor do I want the bad! Especially when it comes at such a high price as my dear chickens. Last week, 3 of my 5 baby chicks were taken. I am quite certain it was a fox. It happened in the evening when the foxes like to hunt. And I know that they live here amongst the wilds. The babies, growing so very fast, could no longer easily fit through the fence. They had wandered off to forage. I heard an excited peeping, the one that says something is wrong. But by the time I got my shoes on & a flashlight (it was evening) it was too late to help the chick. I heard this same scenario 2x that evening. And, the next morning…..only 2 of the 5 chicks remained. I know this is a matter of nature. I have had chickens for almost 5 yrs. now. There is a learning curve with all things in life. It just saddens me that it was the price of my new baby chicks. Adding to the “price of happiness”, having done a “test run” on the baby chick’s size versus the fence size opening, I thought they were large enough to add them back to the entire flock. Boy was I wrong. The next morning one was out, doing a favorite thing, eating the spilled wild bird food. What a treat! I grabbed the chicken net, aka the fish net, and started to pursue her. Little did I know my silly 4 year old Great Dane, Hank, was there to assist. It seemed like Hank was thinking, ” Ma, I got this!” 145 lbs. pouncing on a tiny ,maybe, 1 lb. chick. The result, a baby chick with a terrible broken leg. I had to go to my job that pays me! So I had to put the baby in an enclosure that I had used to protect them as they grew large. And, I had to take the chicken net into the main chicken yard and catch the sibling. Chickens are companion animals. Thankfully, the other baby chick wasn’t so difficult to catch. After a very long day at the paying job, I had to tend the broken baby. My husband, being in sports for many years, had a look. Broken femur bone, ouch! this is terrible. I broke a popsicle stick in two & splinted it’s leg. I hate to say, this is probably not going to end well for the baby’s leg. Is this necessary? I appreciate the good! I really do. Why must we suffer this bad? Especially the innocent. Echinacea a.k.a purple cone flower & bumble bee. Heirloom tomato, what a great slicing tomato! On the gray ,damp, chilled-to-your-bones kinda days like we have today, and will be having for at least 2 more months, I think of things like heirloom tomatoes still warm from the sun. And I think of the bumble bees busily working to harvest the pollen and nectar. And the flowers that smell like honey!! Mmmmmm, summer! Can hardly wait! If you have not had the pleasure of visiting Monticello Va., I would advise this! My heart was full and singing to see all that he had accomplished with plants. And you can purchase seeds dating back to colonial times. This is terribly exciting to me as I am an heirloom snob. And I will continue my quest for seeds I love to grow in my garden. Thanks Thomas Jefferson for helping me “spread the word”! Don’t forget to keep your eyes searching for the free bags of gold so many people put by the curb side this time of the year. If you don’t know what I mean, I’m referring to raked leaves. Over looked and under valued. Very necessarily during the leaf dirth in the winter and summer. I keep bags of them next to my compost pile when I do not have access to other forms of the dry or “brown” part of the compost.